The RAM Mount Vehicle Dock with GDS Technology™ is a spring-loaded, quick release cradle that offers a secure fit and easy access to the mounted tablet. 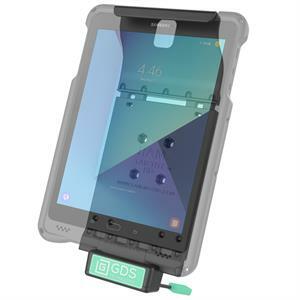 This Tab-Tite™ docking station is compatible with the Samsung Galaxy Tab S3 9.7 with IntelliSkin™ and also supports Qualcomm® Quick Charge™ using the RAM Hardwire Vehicle Charger with mUSB plug. 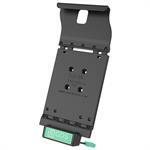 The integrated Ram Mount GDS Technology™ platform enables data and charging capabilities to the mounted tablet. 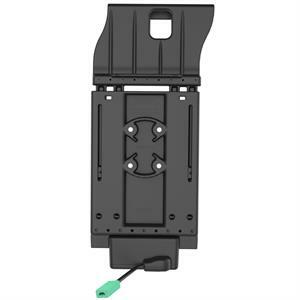 Without the need to remove the IntelliSkin from the device, the user can quickly and efficiently mount the device in the vehicle dock while keeping the device charged. The dock is designed to meet the demands of field workers in a variety of applications including transportation, field sales, logistics, manufacturing and many more.